While you are using Microsoft Office Programs, Internet Explorer or Firefox for surfing the net, or even Windows Live Writer when writing a blog. You use the Quick search in Windows Vista start menu, if you have a clue about the name of the file you want to open. If not, you open the Windows Explorer for navigating, copying, moving, opening and many more. There's an quick alternative for navigating your files. 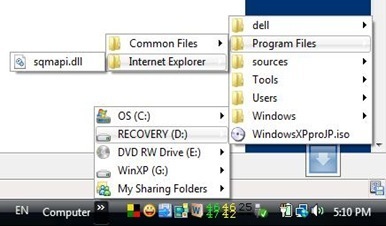 Using the Windows Vista Toolbar, I called "Quick Explorer". You can navigate and open your files easily. You can also copy, delete and move files but it depends on the hierarchy of folders. It is cumbersome to do file copy, if the folder location is located at the topmost part of the folder hierarchy. One thing that I have noticed, at first, when you navigate a folder having a large hierarchy. It will caused an increased in the CPU usage but next time you open it again, it will not increase anymore. Maybe, it is now save in the memory. Same thing happened when I used Quick search in the start menu. 2. 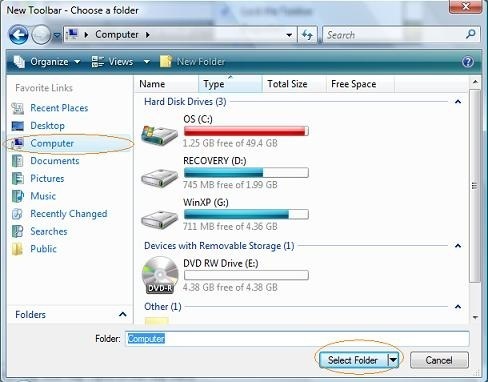 Click the Computer icon and Select Folder button afterwards.